Former Oyster Bay manager Isolde Flamand received her copy of the Oyster Bay book this past week. She remarked that it covered a LOT of ground and brought back many, many memories. Comments like that do a guy’s heart good. If UPS is correct, mine should arrive this week. CAN’T WAIT! That’s right, pixel peeps. Totally hot. Take notes. As promised, here’s the background on my new WhiteOut by Vig WindLight sky preset along with some examples. It started toward the beginning of March, when Isolde Flamand and I were watching a classical violinist. The pavilion was filled, so we parked ourselves up on a hillside to watch the performance. Because she had a prim skirt on, Isolde didn’t want to sit…her avi looked particularly striking standing on top of the hill, so we started an impromptu photo shoot. I started playing with WindLight settings as I am wont to do, and my last tweak resulted in the image you see below this . I don’t believe I saved this exact setting, but it clearly was the precursor for the WhiteOut preset. I really like that shot. Note that the only post-snapshot editing done on the photo was to square it off. Over the next couple days, I kept playing with this concept of a “White Out” in the background with very soft foreground. It resulted in the WhiteOut by Vig setting. Here are a few of my photos from the shoot that I took using my avatar as the model. A couple of the shots were taken at Sabine Stonebender’s Zero Point – a seasoned SL explorer will notice the glowing colors in the background. I hope you enjoy playing with the WhiteOut by Vig setting! If you happen to install it, IM me in-world and let me know how the photos work out for you. 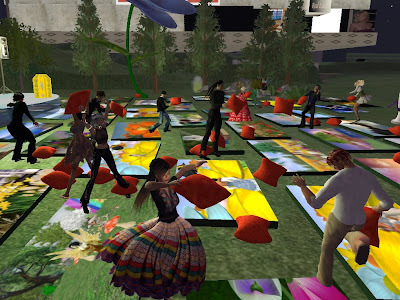 Callipygian Christensen follows up on her sim-wide AM Radio exhibit with an exposition of Madcow Cosmos. I’ve seen a lot of his work from his repeated showings at Oyster Bay, but Madcow’s clearly been busy in addition to what I’ve seen….TONS of new works mixing his bones, steampunk and many, many more designs. Even some human figures (who knew?). Definitely worth seeing. Madcow is one of the true geniuses of Second Life art and sculpture; you’ll never see a vision like his from anyone else.